An earlier post told how I started the walk on the eastern shore of Lake King William at 4 pm. Once on the way, I saw the following views. 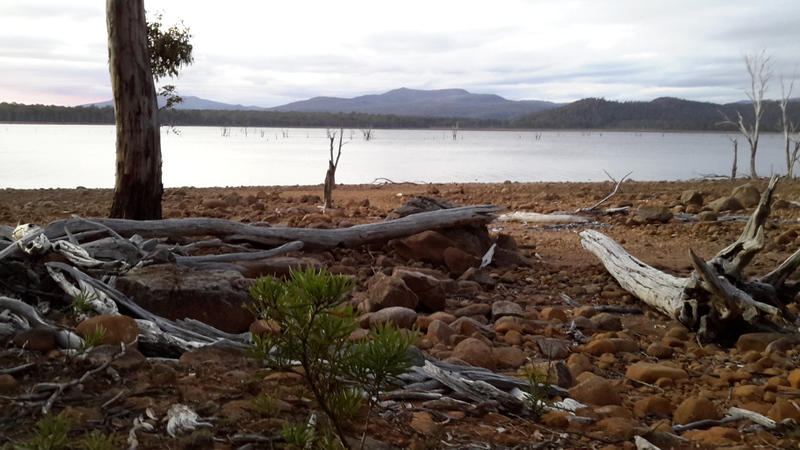 I planned to walk until around 7.30 but I walked until 8.30 pm before finding a spot that I liked near the water. 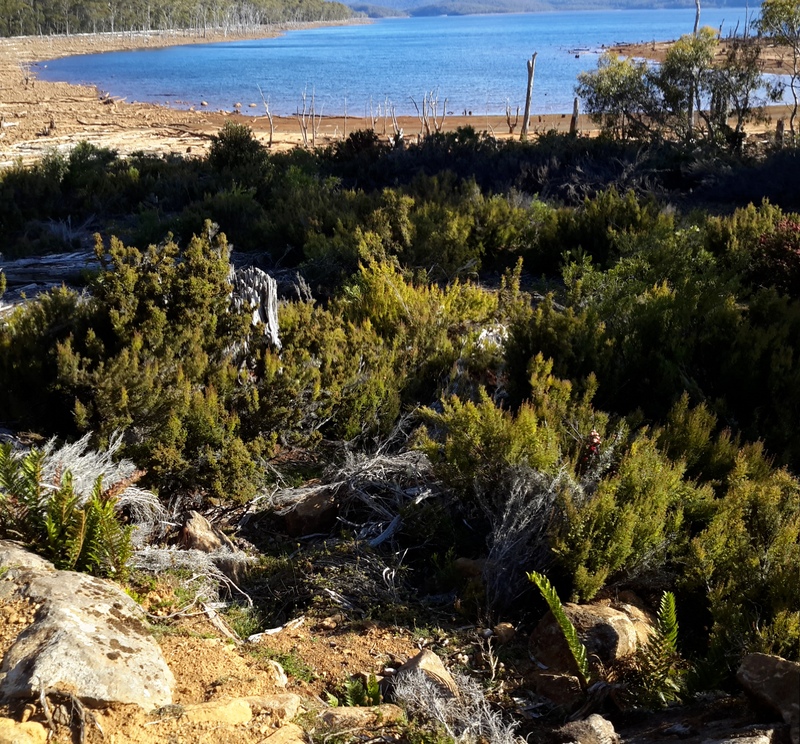 I enjoyed the walk, my knees and ankles and feet were all travelling relatively comfortably, the day had a mild temperature which made passing through the bush a delight, and I was excited to be out in the wilds again and exploring and discovering. Despite considerable research, I couldn’t be sure what to expect nor could I calculate how fast and far I could go. I knew part of my uncertainty was based on not knowing the degree of wetness I might encounter, and not knowing how much bush would be difficult to walk through. 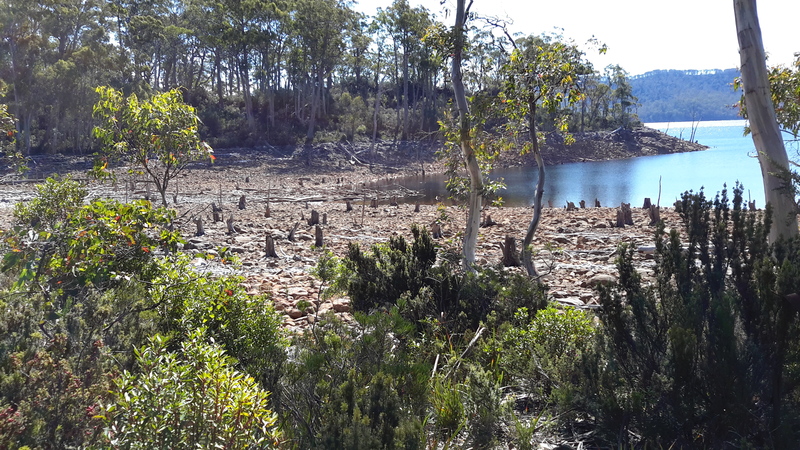 In the end I found it easiest to walk on the blue metal based Switchyard Track where it ran next to the Lake edge or deviated very little inland. Occasionally I walked in the regrowth area beneath the powerlines. I felt free. Lucky. Profoundly happy. Immensely privileged to be able to make such a walk. But as the sun edged closer to the western horizon, a tiny fear began to niggle. Would I be able to find a flat area to pitch my tent before the sun went down? I didn’t want to walk in the dark in case I tripped and injured myself all the while knowing there was not a soul around to pass by and render help if needed. Certainly I was armed with my Personal Locator Beacon but I never want to press the SOS button. I reminded myself of all the luck I have had in life, and how ‘the right thing always happens at the right time’ for me. And so it did yet again: not long before the sun went down I noticed the remnants of a vehicular track T-junctioning the main track on which I walked. That barely visible track headed towards the Lake. 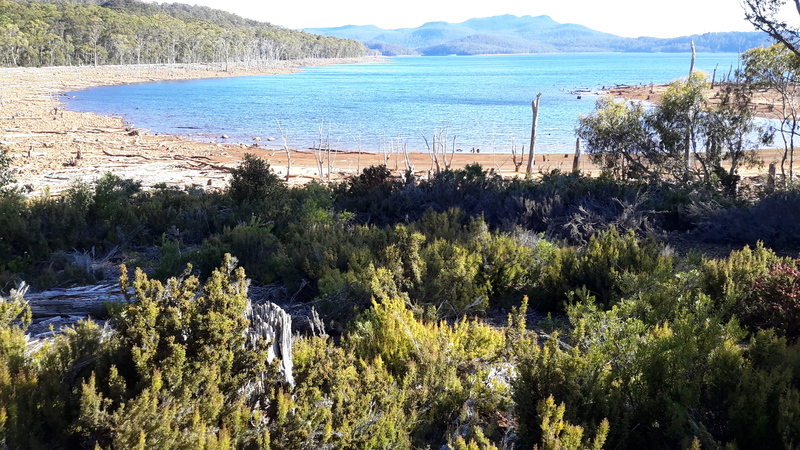 Feeling partly desperate and partly positive, I followed the track until it stopped at the bank of the Lake, fifty or more metres from the water edge. 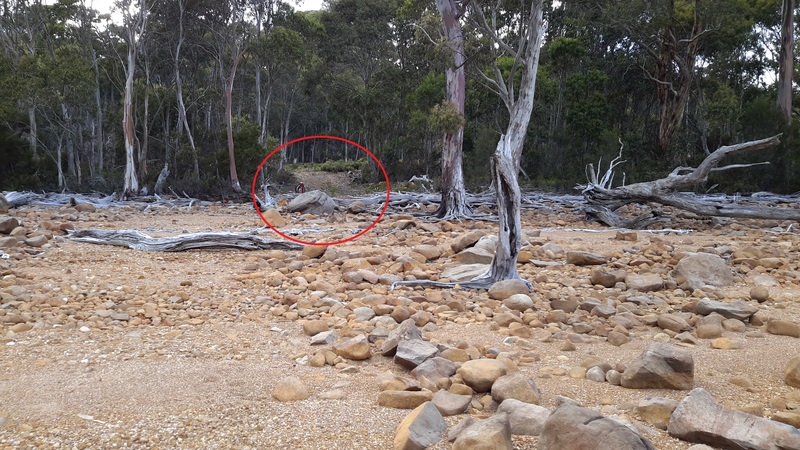 Within the red circle in the photo below is the track on which I camped, and my backpack can be seen to the left of the track – this photo was taken next morning. 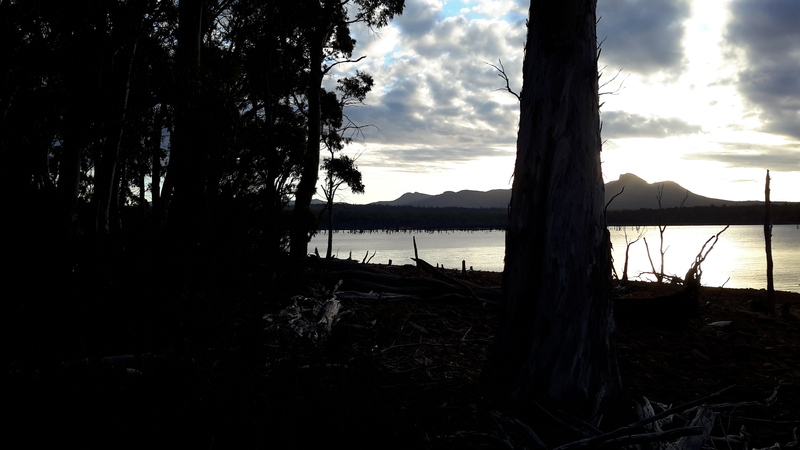 As the sun went down behind the ranges on the opposite side of the Lake. the decision was made for me; so the tent was pitched, my dehydrated dinner set in a water filled billy to soak, and I slipped and flopped over the shore to the water. Wonderfully clean water. Pure tasting water. Untainted. And I remember feeling the water was warmer than the quickly declining air temperature. For a split second I contemplated stripping off and going for a swim. But reason prevailed. No point in catching night air chills. 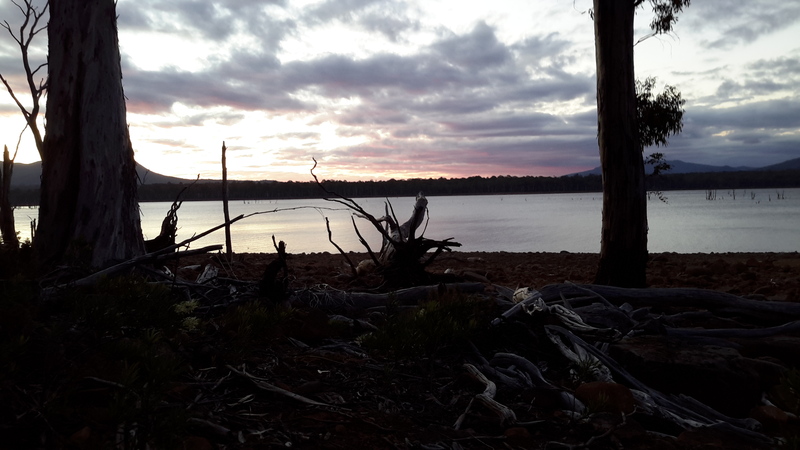 The two photos below are taken after sunset at the Lake bank near my camping spot at the same point and at the same time – because of the intensity of the light my tablet’s camera can’t compensate easily. 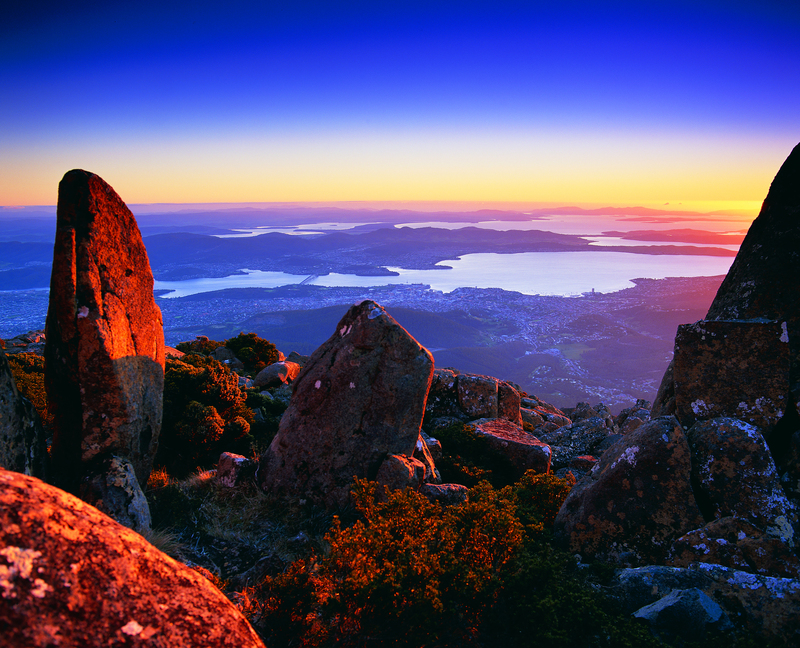 The weather forecast had indicated the overnight temperature could be around 6 degrees Celcius and I felt the dramatic drop as the daylight began to disappear. 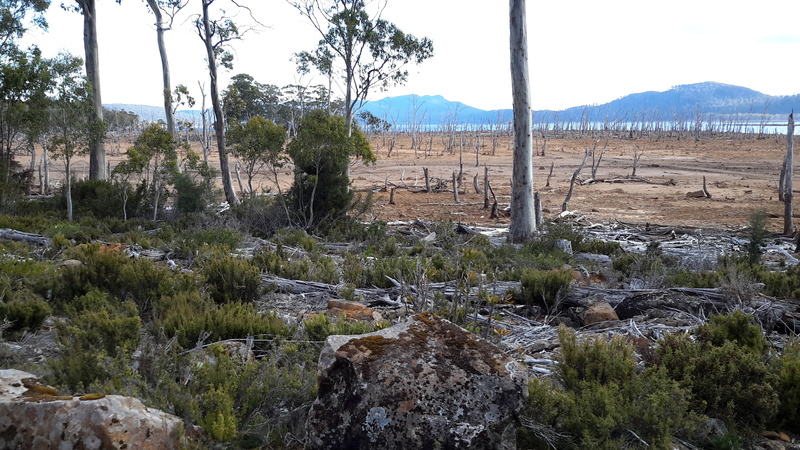 I was glad I carried a winter beanie and thermals and it was a reminder that inland Tasmania has weather/climate extremes regardless of the season (and this is high summer time). My warm clothes were worn until bedtime. And then, perhaps with the shock of the walk and all the related experiences, and/or with the lowering temperature I shivered in my sleeping bag until I relaxed and its warming qualities kicked in. 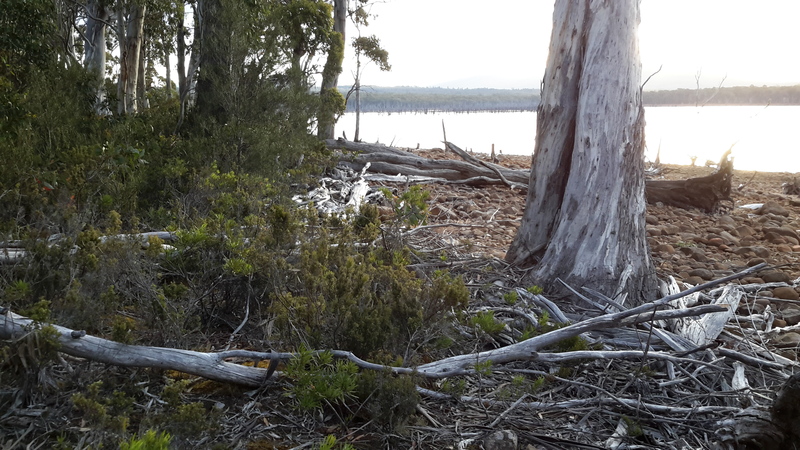 I lay trying to hear the sounds of the night and the bush, but the rustle of my sleeping bag made that impossible. Then I resigned myself that I would never hear the rhythms of the bush. As yet I have not heard the murderous cries of fighting Tasmanian Devils in the night – probably best. So, finally when I was well fed, warm and comfortable, I drifted off to sleep. 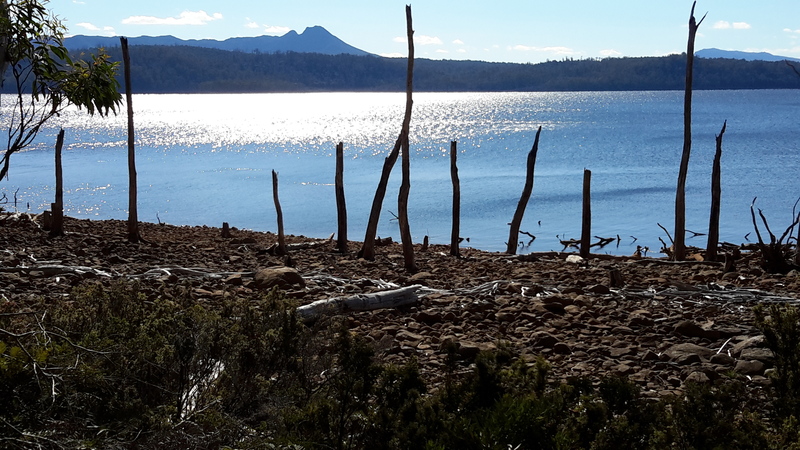 This entry was posted in Derwent River, Tasmania, Walking and tagged Lake King William, Tasmanian devils on January 15, 2016 by Tasmanian traveller.